Son of John Bridgers & Elizabeth Kettlewells Routh, and brother to Rufus R. Bridgers, John L. Bridgers was a prominent and wealthy Lawyer/Planter in Edgecombe County. In April 1861, when it became evident that North Carolina must secede or fight the Southern States, private parties, anticipating the action of the State, were organizing and drilling troops for service. One of the first of these companies was the "Edgecombe Guards" of Edgecombe County. It was organized April 18, 1861, and it consisted of eighty-eight privates, nine non-and four commissioned officers. Its Captain was John Luther Bridgers, of Edgecombe County. Its commanding colonel was Daniel Harvey Hill, of Mecklenburg, who later became a lieutenant general in the Confederate service. The company became known as A, of what was then the First Regiment of North Carolina Volunteers. This regiment was the first of all the North Carolina troops to organize and take the field. Its term of enlistment was for six months and it was disbanded in the fall of 1861. After the enlistment of ten regiments of State troops, this became known as the Bethel regiment from its first battle, and by this name it has passed into history. 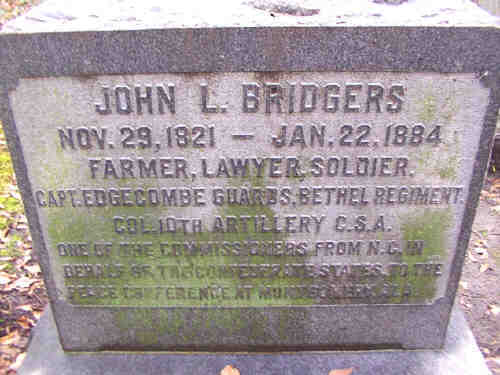 John L. Bridgers commanded the Edgecombe Guards at the Battle of Big Bethel, Virginia, on June 10, 1861 and was Commandant of Ft. Macon in the War Between the States; and after the war was one of the Commissioners from N.C. in behalf of the Confederate States to the Peace Conference at Montgomery, Ala. After the war, he once again took up the practice of law, where his son John L. Bridgers, Jr. joined him. Another notable Edgecombe County citizen, Joseph Blount Cheshire, son of the Reverend Joseph Blount Cheshire and Elizabeth Toole Parker, joined the law firm about 1875 before studying for the holy order. John L. Bridgers married first to Rebecca Louis Dicken on 27 Apr 1847. Rebecca was cousin of Louis Dicken Wilson (Lawyer), who served in the NC Senate and fought in the Mexican War and owned "The Grove" in Tarboro from 1831-1847. A few years after Wilson's death, John L. and Rebecca purchased "The Grove". Architectural historians surmise this is the point (ca. 1850) when the Italianate porch was added and the unusual molding placed in the center hall. Here they raised their 3 children: John L. Bridgers, Jr. (b. 1850), Routh (Ruth) Bridgers (b. 1855) and Charles Bridgers (b. 1858). Rebecca Dicken Bridgers died 30 Oct 1865, leaving John L. a 44-year old widower. Two years later, on 04 Apr 1867, he married 23-year old Mary Elizabeth Battle, and with her (and the first 3 of their 4 children) continued to live in the house until 1881. It was during this time that parcels of the original property (originally 296 acres) were gradually sold off, and the "The Grove" began to lose its rural setting. John L. and Mary would have 4 children: Marcus Milton (1868), Loulie (1870), Whitney Luther (1873) and Mary Horne Bridgers (1882). The Bridgers moved out of "The Grove" around 1881 and they built a Victorian Cottage nearby, that still stands today (2007). John L. Bridgers died in 1884 at age 63. His 2nd wife and their children continued to live in this Victorian Cottage home until their deaths. "The Grove" has been home to some of Tarboro's finest citizens through the years. Thomas Blount occupied the house from 1808-1812, Louis Dicken Wilson from 1831-1847, and Col. John Luther Bridgers, CSA from 1850-1880. In the early 20th century the Town of Tarboro purchased the house, using it as a Community House. It served a number of purposes through the years, including public library, dance studio and central office for the public school system. In 1979 the House was adaptively restored and turned into a museum. Today, the first floor is home to a collection of 19th century furniture, furnishing and Edgecombe County memorabilia. Visitors can learn about the history of the Town, the County and the House itself. The second floor houses the beautiful Hobson Pittman Memorial Gallery and a living museum to Pittman, Edgecombe County's premier artist (1899-1972). Farmer, Lawyer, Soldier/Capt. Edgecombe Guards, Bethel Regiment/Col. 10th Artillery C.S.A./One of the Commissioners from N.C. in behalf of the Confederate States to the Peace Conference at Montgomery, Ala. Note: Spouse of (1st) Rebecca Louisa Dicken and (2nd) Mary Elizabeth Battle. Daughter of Louis B. K. and Elizabeth Dicken of Edgecombe County, NC, and the eldest of 5 children born to the couple. She married the wealthy farmer/lawyer, John L. Bridgers on 27 Apr 1847 when she was just 18 years old. Mother of John Luther Bridgers, Jr. (1850), Routh (Ruth) Bridgers (1855), and Charles Bridgers (1848-1859). 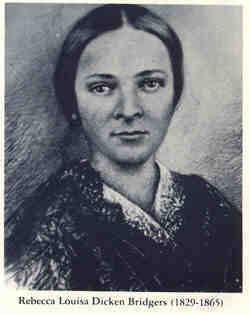 Rebecca died at her home, "The Grove", in Tarboro, NC on October 30, 1865 at age 36. • Picture: Head Stone of John Bridgers Sr.